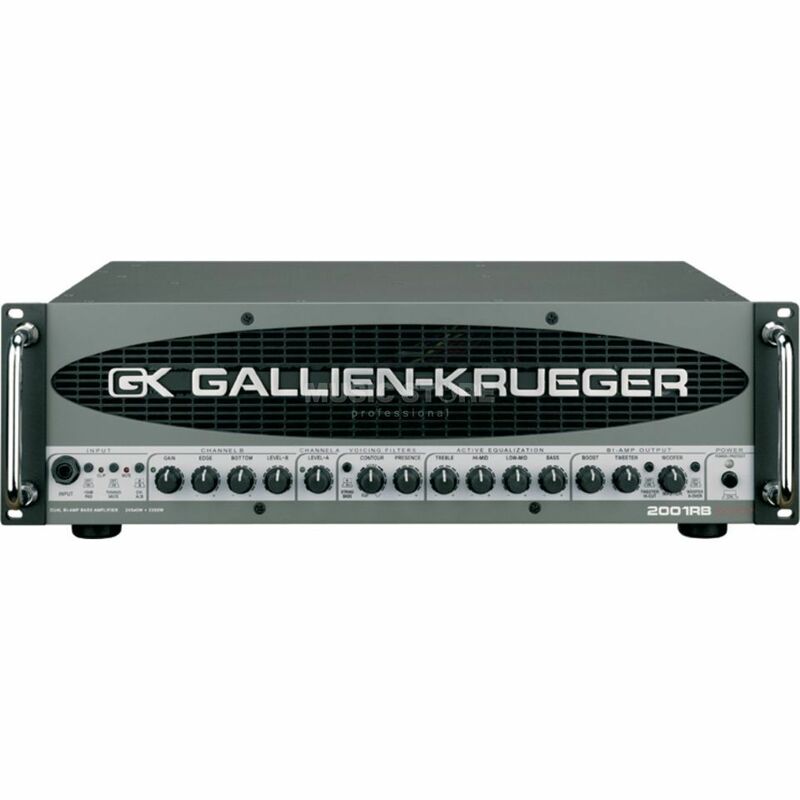 It's the big gun, GK's candidate for the ultimate stage rig! This unit is based on the bi-amp system from the 1001RB but with dual 540W woofer amps bridgeable to 1080W, two 50W horn amps, and two continuously variable speed fan for cooling. Features: Power: <1% THD: Main Amp-2x540W at 2ohm, 1080W Bridged at 4ohm 1kHz -- Horn Amp-2x50W at 8ohm,5kHz Cooling: Dual Continuously Variable Speed Fans Input section: Ultra low noise S/N>90dB, Clip LED, -14dB Pad, Mute Switch, Mute LED and A/B Switch High gain (B): B LED, Gain, Edge, Bottom and Level Controls Low gain (A): A LED and Level Control Voicin filters: 5/4 String Voicing, Adjustable Contour and Presence Equalizer: Bass Specific Series Four Band Active Output: Boost, Tweeter Level with High-Cut and Woofer Level with High-Cut Direct out: XLR, Level Control, Ground Lift and Pre/Post Switches Patching: Send, Return, Tuner Out, Chain in, Chain Out and Footswitch Jack Speaker out left: Two 1/4" and two HMS Compatible Speakon Connectors (Bridge/Mono), Bridge/Mono Switch Speaker out right: Two 1/4" and two HMS Compatible Speakon Connectors Control: Trigger In, Trigger Out and IEC Power Connector Weight: 40 lbs Incl. Footswitch Dimensions: 19"W x 5.25"H x 12"D !!! 3-years Music Store warranty !!! !!! 30-days money back guarantee !! !